Tennis fans have been in for a treat this year with the quality tennis that was displayed throughout the past half year. This year’s Wimbledon also saw the shock defeat of Novak Djokovic and the smashing of his dream of achieving a calendar year Grand Slam. Well, those who indulge in tennis would definitely have had experience the pain of tennis elbow, which has also seen numerous treatment options such as the Tenease being introduced before. What happens if nothing ever worked for you? You might then want to consider the $99.95 Cordless Tennis Elbow Pain Relieving Sleeve. 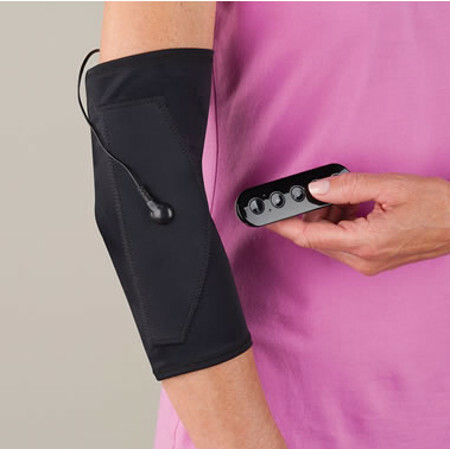 Touted to be the only cordless neuromuscular stimulator sleeve which will be able to help provide relief from tennis elbow, it has been specially developed to be worn on either elbow. This particular sleeve will make use of Transcutaneous Electrical Nerve Stimulation (TENS) therapy, which happens to be a method of pain relief therapy that is widely adopted by medical professionals. The battery-powered electrode pads will hook up to the sleeve via snap-on fasteners and send harmless low-frequency electrical pulses into the tissue to block pain signals from passing through nerves to the brain. The American Physical Therapy Association claims that TENS therapy is able to be an effective element of pain management for low-intensity discomfort, and this includes back pain and muscle soreness in the extremities. It offers up to 15 hours of power from an eight-hour charge, where the electrodes are juiced up via the included USB power cord.